Dedicated to sensitive or irritated scalps, this composition of natural oils with anti-inflammatory and anti-oxidant properties offers an immediate soothing effect thanks to its comprehensive action: it normalizes and purifies the scalp, rebalances sebum production, reduces dandruff and redness and repairs skin’s hydrolipidic film to prevent dehydration. The roll-on bottle allows for precise application on targeted areas. 100% natural and fragrance-free formula. Contains no essential oils. 20ml, .68 oz. I saw this recomendation in a magazine, came home and ordered the same day. I have used twice and the result is remarkable. My sensitive scalp areas feel so much better and are no longer sensitive or painful to the touch. Amazing! So happy for this product! Thank you so much for your review. We are so pleased to hear our Huile Apaisante has aided your sensitive scalp. One of our customer service representatives will reach out to you in the coming days with more information, so be sure to check your email. Does it’s job – a little goes a long way to soothe an irritated scalp. I’ve been plagued with irritated scalp after receiving color treatments for years.My scalp would be itchy and at times painful forcing me to wash my hair several times. The Huile Apaisante has been a true savior. I apply it right before I get color. It allows me to actually enjoy my fresh from the salon look as well as decrease the skin staining around my hairline as an unexpected bonus. Thank you Leonor Greyl for another terrific product!! Thank you so much for your review – we love hearing from our customers and appreciate that you took the time to write this review. Please let us know if we can ever be of help to you. Have a wonderful weekend! In the beginning of 2017.. I started noticing hair at the bottom of my drain in my shower. That NEVER happened.. so I became very worried after letting a few weeks go by and continuing to see more hair fall. To make a long story short… I went to doctor after doctor throughout 2017 and no one could tell me why I was losing all of my hair. I’m 26 and they kept telling me it was stress related. I know my body and I knew they were wrong. I started doing my own research and after weeks of that I went to a doctor I had never seen before and that knew absolutely nothing about what was going on or my medical history. I told her I thought I had seborrheic dermatitis and she looked at my scalp and it took her 5 seconds to say I was right. It turns out a birth control triggered it. I have never had any kind of skin issues before. Not even pimples. It’s completely shattered my self confidence. I have long strawberry blonde hair and it was extremely healthy until I started using the prescription shampoos to treat the seborrheic dermatitis. None of it gets rid of the dermatitis completely and it’s so damaging/drying to your hair. I have spent thousands of dollars on shampoos and treatments for seborrheic dermatitis and nothing compares to this product. I found this on Dermstore…. there were not any reviews at the time(there is now.. me) but I was desperate.. and I’m so glad I did because it is the best thing I have bought for my scalp, hands down. This is a game changer for people with seborrheic dermatitis. (Now I just have to find a way to grow back all of my hair. I did purchase your hair loss treatment package but I know I have to be careful with some of the products because of ingredients.) Anyways- I am so happy I found y’all via Dermstore. Y’all are absolutely brilliant. Y’all continue to impress me as I read more and more about y’alls brand. I will forever be a customer. I am happily using a number of LG products for my colored/highlighted relatively short fine hair and very sensitive scalp. Therefore, I had high hopes for Huile Apaisante, especially since it does not have an added fragrance. So far, however, I can only report that I can hardly tolerate the scent of this ‘unscented’ product. To be fair, another customer loves the scent, and my nose is unusually sensitive. I will use Huile Apaisante prior to my salon color next week, and report if it made any difference. So far, I prefer Huile LG on the drier ends of my hair and have not discovered a clear benefit by using Huile Apaisante on my scalp. However, reviews of the product differ, and I will indeed report back if I found a positive effect when using it prior to my color appointment in the evening of 7/26/18. Huile Apaisante was recommended to me a few months ago, not because of a dry scalp, but because of dry/cracked hands. I have a horrible case of eczema that started 2 years ago. Like many people, I have tried every lotion/Vaseline under the sun and nothing helps past than the next time I have to wash my hands (I have to wash my hands a lot as I work in a hospital and I have 2 kids under 3) I used Huile Apaisante multiple times a day on my hands, pretty much every time after hand washing, and it has given me incredible relief! After a week of constant use, my hands were no longer cracking and bleeding. Now that my skin is under control I just roll Huile Apaisante on my hands once each day before bed. I can not say enough great praises about this product! It really has and continues to help my dry skin everyday. Please give this product a try if you have any type of dry skin! I love almost (85%) all of Leonor Greyl products, and there are several that I feel like I can literally not live without. That being said, I think that this one just isnt one I personally feel the need for. It smells great and feels great, but I think for me, the Huile de Leonor, as a pre shampoo treatment is a better fit……love that one! This one does seem like a good product though. Deborah- We’re happy that you love our products! 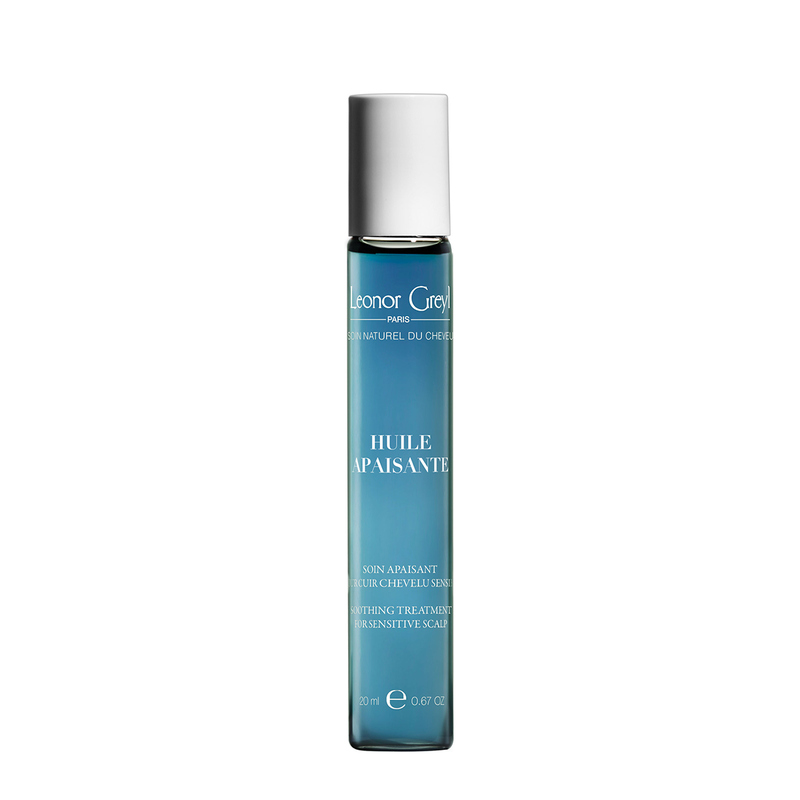 Huile de Leonor Greyl is perfect for length and ends and the Huile Apaisante is targeted specifically for the scalp. You’ll see the biggest benefit from the Apaisante if you’re experiencing scalp issues such as irritation, redness and flaking. Thank you for your review! I love Huile Apaisante, I use it before and after I have my hair colored. I find that my scalp doesn’t get irritated by the hair color and my color seems to last longer without fading. I don’t know why but that only happens when I use Huile Apaisante. Every Leonor Greyl product I have used has been exceptional. Love the new Huile Apaisante! Thank you LG! I had three rounds of chemo on 4 separate occasions in the last five years. I didn’t lose my hair; rather it became curly! Chemo, did however dry out my scalp. Although it’s been 16 months since last chemo tx, my scalp continues to itch so badly I was using Sarna (non steriod soothing skin cream) to alleviate discomfort and redness. Then along came Huile Apaisante… a miracle solution. It relieved inflammation and itching upon 1st application. I’ve had such dramatic improvement, that with my monthly hair care budget, I purchased a bottle for each of my four “chemo” friends. One girlfriend’s husband stole it from her; she purchased her own and hides it in her linen closet! THANK YOU LG! All your products have significantly improved my scalp and hair; but Huile Apaisante is the lovely, lovely, lovely frosting on the cake. I have very sensitive scalp. Every time after coloring (or perm) my hair, my scalp will become red, itchy and start to have dandruffs. I received the product just right after a routine hair coloring. I apply the the product as directed right away. I didn’t have dandruffs nor did my scalp become itchy. It worked like a miracle! Strongly recommend it! I have tried many of the Leonor Greyl oils and this is my favorite. I apply it before shampooing about once a week. No conditioner after. My hair is just the right texture and weight to style. The applicator is incredibly easy and efficient. One of my favorite products so far — and I try many of them! Over the years my scalp has been sensitive and is exacerbated when I have my hair colored. I have been using Huile Apaisant weekly for the past three weeks and it definitely soothes the scalp. I have noticed less itching and irritation. The rollerball is easy and quick to use. Also the scent of the oil is subtle which I love due to an aversion to fragrances. I received the product Huile Apaisant. My experience with this product has been excellent. I have used it twice so far and from the first application my hair had a transformation. It looked healthier, shinier and the most noticeable effect was that the oil left my hair supple and very docile. Also the styling lasted longer and my hair did not get frizzy during the high humidity of the last few days in LA. a great chance for soothes a dry scalp. Rolling directly onto your scalp and massage gently before the shampoo. If you routinely dye your hair, now might be a great chance for soothes a dry scalp. Rolling directly onto your scalp and massage gently before the shampoo. Love! Just had my color done and my colorist applied this on my scalp prior to color. I usually experience tingling and slight irritation – this time – nothing! Felt great and worked immediately. Will also use in-between color when/if my scalp feels dry or itchy. Highly recommend! I love it! It’s so easy to roll on the scalp. The smell is good! Not oily at all! I will use it every time before my color re-touch! At a time when lifestyles are busier than ever, scalps are becoming increasingly sensitive. Stress, pollution, poorly-rinsed shampoo, styling products that leave behind residue – all these factors contribute to redness and irritation. These red flags led my family and the Institute putting our heads together to come up with a way of getting things back under control.” Caroline Greyl. And so Huile Apaisante was born in 2018: an oil specifically designed as a long-term solution to problems experienced by people with sensitive, allergy-prone scalps, thanks to the powerful soothing and calming properties of its oils. This targeted, 100% natural formula embodies the brand’s expertise and knowledge of scalp health.